My post is late this morning since I’ve been enjoying the wonderful 60 degree weather when I woke up! It’s “fall” in southern Texas, at least for a few days. So I decided it was time to share some more of my Fall creations that my classes will be doing this month. First up is a very simple and quick card with a twist, literally. This is a common template for many cards you see, turning the layers in different directions on the card for added interest. I used some new products, some old favorites on this card. I used the new Happy Notes stamp set and the coordinating Lots of Labels framelits dies. It’s quite versatile set with a number of greetings and the great part is that they are bundled together to save you 15%! 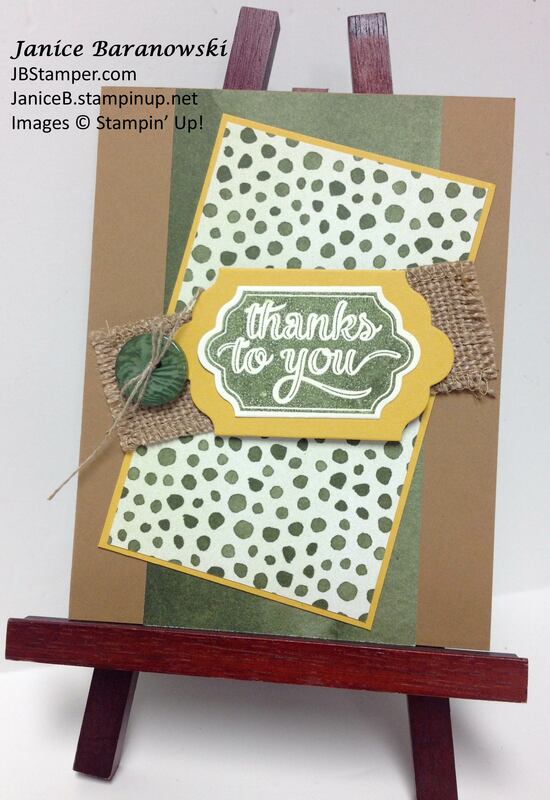 My card base is Soft Suede with accents of Hello Honey from the 2013-15 In-Colors and the Mossy Meadow ink. I added a piece of burlap ribbon which says fall to me. I used a retired Regal color button with a linen thread bow to carry through the rustic fall theme. The designer paper is from the retired Color Me Autumn which I love and couldn’t pass up using here. Now back to enjoying the cool temperatures with my second cup of coffee. And watching my kitties run open window to open window sniffing the air and wanting out. The open windows is as close as you will get to outside, sorry girls! Here’s the things I used for this card. Happy Stamping! Don’t forget tomorrow is “World Card Making Day”! Get together with friends and make some hand stamped cards! This entry was posted in Annual Catalog, Fall cards, Thank You cards and tagged Color Me Autumn, Happy Notes, Lots of Labels, Stampin' Up!, Stampin' Up! Bundles. Bookmark the permalink.